I’ve been attending the Annual Assembly of Hospice and Palliative Care (AAHPM/HPNA) for nearly a decade, but this is the first year I presented a concurrent session. As I return to work, the glow from my 15 minutes of Friday morning fame fading away, I wanted to share a few thoughts for those who, might feel intimidated about submitting an abstract. An abstract can only be accepted if it is submitted. I spent years coming up with ideas for a presentation, but ultimately deciding they were not good enough. A trusted mentor encouraged me to submit my ideas anyway. He saw value in the process even if it meant I might get rejected. The process was an opportunity to learn what messages I wanted to share, develop the ideas fully, and receive feedback, thereby refining those messages. That said, only approximately 20% of abstracts are accepted for presentation at the AAHPM’s Assembly, and getting the rejection can sting. It is helpful, therefore, to have an alternate plan beforehand, whether it be submission to a journal, blog, or other conference, or to rework it and submit again in the future. I often limited myself because I thought I didn’t know anyone in the field with whom to collaborate, and hadn’t considered collaborating with those outside the field. Last year, when I had an idea worthy of submission, I reached out via AAHPM Connect, an online community for those in hospice and palliative medicine, and quickly found several people willing to collaborate. Multiple professional venues provide ways to find potential collaborators, such as list-serves, social media, and collegial networks. Submitting an abstract with others helps you and your colleagues grow. One of the most rewarding things in my daily practice is helping others grow, especially across levels of experience, disciplines, or specialties. Collaborating with others on a presentation was a powerful way to get non- PC colleagues exposed to palliative care, early-career colleagues enthusiastic about national involvement, and experienced colleagues invested in mentoring junior colleagues. Work done in collaboration almost always turns out better. The initial vision I had for our presentation was adequate, but it was so much better after several rounds of group discussion. Each of us brought a different perspective, skill set, and experience. Far from being limited by people you may worry are “the weakest link,” the presentation was all the more powerful thanks to the diversity of thought and contagious enthusiasm. And we had a lot of fun in the process. You have something to offer! Wisdom comes with experience and applied knowledge. Attendees at health care conferences include many who are primarily clinical. You do not need to conduct randomized controlled trials to have a good idea for submission. While scientific studies are critical for advancing our field, there is also value in showing how clinicians have effectively integrated research into clinical practice or created effective models for delivering care. Presentations honor our patients and renew our compassion. In palliative care, we learn from the experiences our patients and families generously share with us. 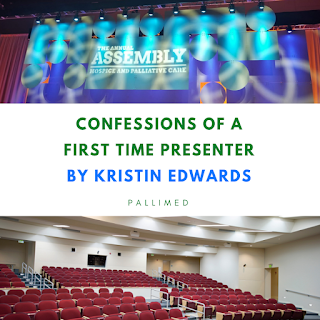 When we present at a conference, even if we don’t discuss specific patient stories, we share what our patients have taught us. By sharing those lessons with a broader audience, we may help bring purpose to some of the suffering. We experience renewed compassion when we interact with participants after a presentation, who connect us with others who have similar experiences. Find a mentor to guide you. Mentors may have experience navigating implicit expectations for abstract and publication submissions. Mentors may be senior to you and can also be peers; powerful learning goes both ways. I had the great fortune to work with a mentor through the AAHPM Mentor Match program. Mentor Match is an online part of AAHPM where members can find other members willing to be mentors from specific backgrounds or in specific areas. Especially if you have a specific skill to develop, reach out to find a mentor in that area. Drafting an abstract requires a relatively small investment of time, but comes with so many personal and professional benefits. The personal learning, professional connections, renewed enthusiasm, and growth opportunities are well worth the risk of rejection. So if you have an idea you’ve considered, think about reaching out to your community, get input from others, and take a chance to submit. The deadline for AAHPM concurrent session abstracts for 2020 is May 1st, 2019. Kristin Edwards, MD, FAAHPM is the medical director of Palliative Care at Yale New Haven Health - Bridgeport Hospital. Her passion is palliative care, medicine, education, and resilience. You can find her on Twitter at @KristinMDCT. This article isn’t going to change your practice. Why am I reviewing Braun et al.’s survey regarding oncologists’ beliefs, practices, and knowledge regarding medical marijuana use? 1. I went to a Willie Nelson concert and my clothes still reek of marijuana; 2. One of my palliative care fellows is interested in understanding Palliative Care clinicians’ educational needs regarding marijuana; 3. I visited a dispensary in Pennsylvania where I was told medical marijuana treats diseases ranging from opioid addiction to headaches to nausea and vomiting (in pregnant woman). This annoyed me and I wanted to see what other doctors thought. First, a caveat, I have provided medical care for HIV positive patients for over 25 years and I view recreational marijuana use like recreational alcohol use, something that is a personal choice and of minimal risk. I am not sure of marijuana’s medicinal effects (I believe the data is very poor) and I think in moderation it is safe. When Pennsylvania legalized medical marijuana, I signed up and of the roughly 25% of the patients I see in my oncology palliative care practice are referred by oncologists for medical marijuana. Everyone asks me about medical marijuana – from the administrative assistants to my colleagues and oncologists. I therefore was quite interested to learn what Braun et al. had discovered regarding oncologists’ beliefs, practices, and knowledge about therapeutic marijuana use. (1) They surveyed a nationally representative sample of oncologists including medical, gynecological, neurological, and pediatric who were involved in patient care. Radiation oncologists were excluded. 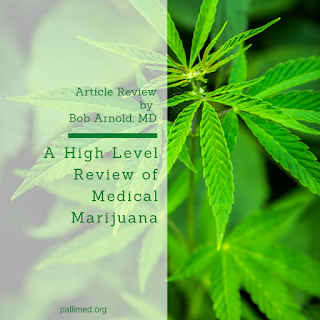 They were interested in whether oncologists reported discussing medical marijuana with patients, recommended it, or felt sufficiently informed to make such recommendations. The survey also queried oncologists’ views on medical marinjuana’s comparative effectiveness for several conditions. Bivariate and multivariate analyses were performed using standard statistical techniques. They surveyed 400 medical oncologists and had a response rate of 63%. The oncologists were predominantly white males and were equally split between being in practice less than 15 years, 15-24 years, and greater than 25 years. Interesting they didn’t tell me how many of them used marijuana recreationally or what their views were about recreational marijuana. Roughly 50% practiced in states where medical marijuana was legalized. Despite only 50% practicing in a state where medical marijuana was legalized, 80% had discussed it with patients and 46% had recommended it to at least one patient in the last year. Only 25% felt sufficiently knowledgeable to make recommendations and 56% of those who had recommended it did not consider themselves to have sufficient knowledge to make a recommendation. Given their lack of knowledge their views regarding medical marijuana’s effectiveness for various symptoms should be taken with a grain of salt. Regarding pain they were split a third yes, a third no, a third don’t know; regarding anorexia 60% thought it was equally or more effective than standard therapies; 45% thought it equally or more effective for anxiety. Oncologists viewed medical marijuana as lower risk than opiates for death and addiction, and comparable to opiates for paranoia and confusion. As a study, this survey is rigorously conducted. They based the survey on semi-structured interviews with key informants and did cognitive interviews prior to finalizing the instrument. They had a highly trained group administer the survey. Their response rate was great for physicians and their sample was nationally representative. Their aims were clear, and their survey questions and analysis allowed them to answer aims. Rather than medicalizing marijuana, why not legalize it? (6) Then patients can take it or not take it the same way they decide to have a drink and we as clinicians won’t be responsible for pretending that we know enough and that there is enough knowledge to recommend it for medicinal purposes. So, reading this article largely made me frustrated about our national public policy and views regarding science. It also made me wonder about a number of other projects that need to be done: 1. What are Palliative Care clinician’s views about this matter? ; 2. What is the use of marijuana in states where it is legal compared to states where it is only legal if prescribed by a physician? ; and 3. How does Willie Nelson stay so thin (and look so healthy) given the amounts of marijuana at his concerts? More Pallimed posts from Bob Arnold can be found here. More Pallimed journal article reviews can be found here. More Pallimed posts on marijuana can be found here. 1 Braun IM, Wright A, Petett J, Meyer FL, et al. Medical Oncologists’ Beliefs, Practices, and Knowledge Regarding Marijuana Used Therapeutically: A Nationally Representative Survey Study DOI: 10.1200/JCO.2017.76.1221 Journal of Clinical Oncology 36, no. 19 (July 1, 2018) 1957-1962. 3 The Pennsylvania law regarding medical marijuana includes a research arm. See http://www.goerie.com/news/20180820/state-issues-new-medical-marijuana-research-rules. 4 From https://www.statista.com/statistics/585154/us-legal-medical-marijuana-patients-state/ . Accessed Sept 26, 2018. 6 Interestingly on the day I wrote this, a Pennsylvania legislature introduced a bill legalizing Marijuana. An article about end-of-life care has been making the rounds this week by Haider Warraich, MD from the online magazine Vox. Titled, "The way we die will be considered unthinkable 50 years from now", it is part of a series asking 15 experts to think about how the actions we take now will look like errors in 2070. I have seen people on Facebook and Twitter share it with quotes pulled or superlatives attached. Yet when I read it, I didn't feel the same enthusiasm; I felt frustrated. When you read the article, key points seem to be very supportive of palliative care and hospice efforts, but on closer inspection of how our field is being presented by a cardiologist, he simply reinforces the same misconceptions of what good end-of-life care can be. I will illustrate some examples below, but first, it may help to understand the writer of this piece, Dr. Haider Warraich. He is a cardiology fellow in the heart failure program at Duke and has written a book, "Modern Death: How Medicine Changed the End of Life." He has published research on prognostication in heart failure and numerous opinion pieces in the New York Times along with other prominent online news sites. He clearly is very interested in end-of-life topics, and by his numerous pieces, he is positioned as an advocate for hospice and palliative care. Yet when I read his pieces, I am reminded of the physician or nurse who likes palliative care a lot, gets us involved early and often, but at certain times, there is a small but significant misunderstanding of what our role in a case may be. I am reminded of Stefan Friechsdorf's concept of 'pallilalia,' which he characterizes as when "repetitive absurdities are spoken about palliative care in general and the PPC program specifically, without anything being done to advance its development." I don't think Warraich is being absurd; I do find his writing to be earnest. But I am concerned his effort is potentially damaging. 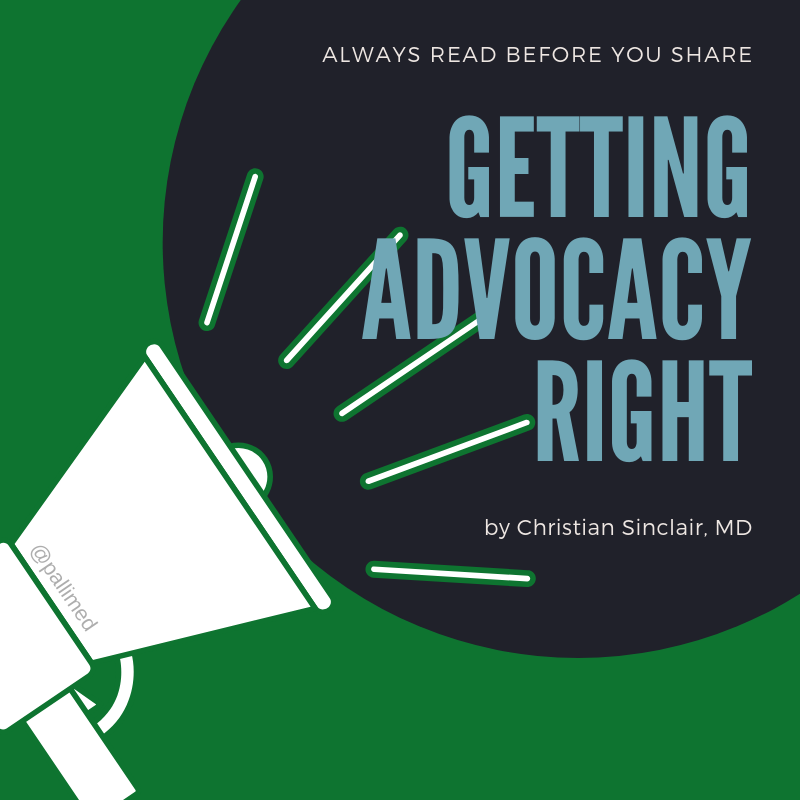 Now that the scene is established, let's break down the article, and see why this messaging around palliative care is not as clear as it needs to be. First, the anecdotes. Two anecdotes highlighting doctors ignoring patient's wishes; one from 50 years ago in which more aggressive care was given, and one recounting a story where DNR orders were placed on patients without patient or family knowledge. Both are awful stories but are not representative of health care today, and if that is being done in 2019, that should be reviewed by the hospital, the medical board and possibly courts. But the reader take-away is: "Don't trust doctors. They're sneaky and won't listen to you." Not a great starting point to a far more complex problem. Other issues with the anecdotes are present. The 1st anecdote was published in BMJ in 1968, but refers to an overseas hospital, presumably not the United States. ¯\_(ツ)_/¯ The 2nd anecdote links to a 2004 book, instead of an original reference from...1984. THIRTY-FIVE YEARS AGO! Anecdotes from 50 years and 35 years ago do not represent the standard of care in 2019. I get the point was to tie to a historical look-back, but it just reinforces mistrust, which will come back a little bit later. In the 5th paragraph, the lumping together of pacemakers and left-ventricular assist devices (LVAD) is problematic. Deactivating defibrillators (not mentioned in the article), pacemakers and LVADs all bring up unique aspects of ethics, cardiology management, and comfort. LVAD utilization is increasing, presenting some ethical challenges that medical teams, patients and families are able to work through with good communication. Guidelines reinforce the early integration of palliative care for people eligible for LVAD therapy, and this rollout has been helpful to balance technology advances with patient-centered care.. That would be great to highlight, but Warraich does not. Instead, he cites a Sep 2017 study that shows 13% of cardiologists believe deactivating an LVAD is a form of euthanasia or physician-assisted suicide, but in the Vox piece he writes, "Many patients with terminal illnesses who want to deactivate these devices find resistance from the health system, since some continue to equate deactivating them with euthanasia." [Picks jaw up off floor]. When you bring up a deeply complex ethical and social issue like euthanasia in the first 5 minutes, you instantly polarize your readership. Are there times when it is important to discuss topics like requests for hastened death? Sure. But not right here, not right now. Just bringing it up in this nonchalant way, Warraich essentially weds the issue to palliative care to the reader. OK, 6th paragraph, I'm getting a little fatigued at this point, but let's keep going! Warraich brings up the name issue - palliative care freaks people out. But as we also saw this week, palliative care is the fire department, not the fire. In citing two articles about patient and physician association of palliative care with end of life, he again inextricably ties together that palliative care *is* all about end of life, even though he ultimately argues for a concurrent model of palliative care. He also links to an article and the accompanying editorial about teams changing the name 'palliative care' to 'supportive care', and implies when people think about palliative care they have every right to think 'they will be abandoned.' To a public reader, this whole paragraph boils down to, "Many patients and doctors think palliative care only means end-of-life care. Pretty scary to think about these beliefs I am reinforcing. Then doctors change their team name so you will not be scared, even though you should be scared because I already reinforced your beliefs. Remember when I started off this piece saying doctors are sneaky?" Ugh, I feel like this battle will never end. But I am encouraged because I know this is not what I and many other palliative care teams see everyday. While this would never be published as research, there are many programs including my own that have grown year over year at a steady pace, and they never changed their name. As the piece reaches the conclusion, Warraich undermines his own argument of palliative care involvement and cites the 2016 JAMA 'Fast-food style palliative care' study which was critically panned by Alex Smith at GeriPal. The Vox piece emphasizes that palliative care increases PTSD symptoms in family members. Warraich uses this to advocate for better discussions led by the primary teams, a noble goal that many palliative care teams are working towards in their institutions. But, if you read Alex Smith's analysis of this study on GeriPal, you can see this study was not full-contact palliative care as practiced in many hospitals today. If anything, this study should support early involvement before a crisis, more funding and collaborative management by primary teams and palliative care teams. I appreciate the shoutout for lack of a palliative care workforce to handle these situations, but if he is saying we cause PTSD, why would anyone want more palliative care clinicians? The conclusion finishes a bit stronger except for the line, "End-of-life care is not just palliative care’s business," which again seems like an advocacy line, but instead is a step backward. This backfire effect is illustrated well in a paper by Nyhan and Reifler who looked at messaging around the religious beliefs of President Obama in 2009. The backfire effect is essentially when someone's strongly held beliefs are challenged by opposing facts, their original beliefs are paradoxically strengthened. When we deny misinformation, it reinforces the misinformation. Therefore we should focus on the positive/truthful associations. So given that I addressed a lot of misrepresentations in the Warraich Vox piece, I also plan to publish an alternate universe version in the coming days. Christian Sinclair, MD, FAAHPM, is a palliative care physician at the University of Kansas Health System and editor-in-chief for Pallimed. He hopes to one day write a book like Dr. Haider Warraich has already done, and appreciates all non-palliative care clinicians who advocate for better end-of-life care. He also recognizes that his own writings in the past, present and future may not always best represent pallative care and is open to feedback. Multiple times in this article 'end of life care' is referenced, but it should be written as 'end-of-life care.' This second way demonstrates that 'end of life' is being used as an adjective to describe the type of care, instead of the stopping of 'life care.' That one is on the editor, not the author. The other one being: check the URL. The URL for this article includes 'end-of-life-palliative-care' essentially linking those two as inseparable for anyone who bothers to look at the actual link. That is on the website, not the author, but if we are trying to change how palliative care is presented, small things like this add up. 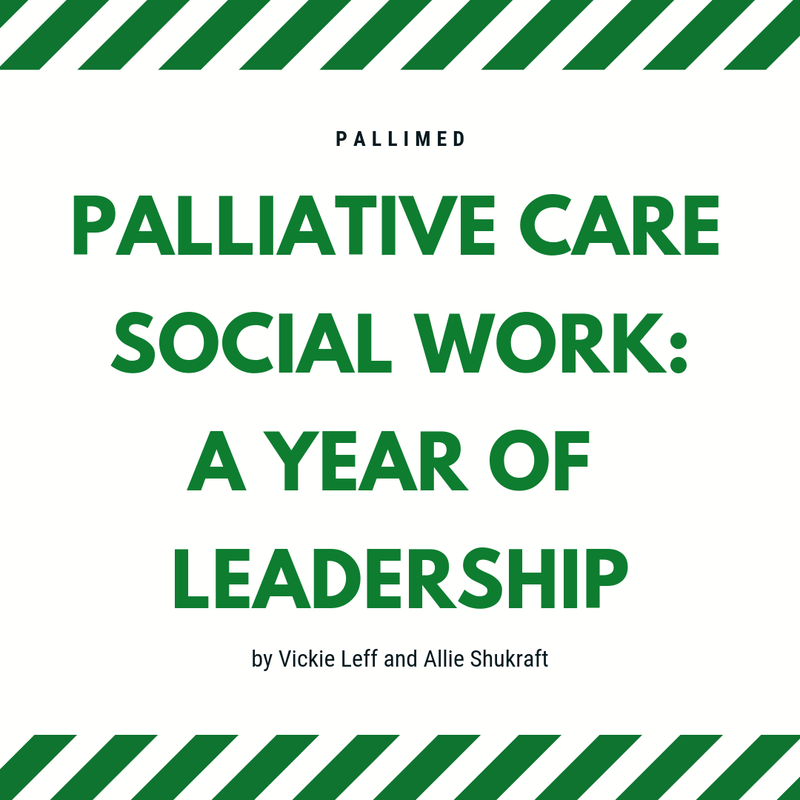 It has been an amazing year for those of us who are palliative care social workers. The 4th edition of National Palliative Care Guidelines, published this fall, adding several psychosocial focused domains to the list of best care practices.1 Many of the 8 domains specifically highlight the expert skill set of social workers on the interdisciplinary team. Palliative care social workers were delighted to see these highlighted in the guidelines. Palliative Care teams work best when they allow members to practice to the top of their license. Although there is often overlap, especially in the arena of psychosocial care, social workers are usually the backbone of providing these services. We saw the FIRST advanced practice, evidence-based certification for palliative care & hospice social workers open for testing in January 2019: a significant step for social workers in a concerted effort to be recognized and respected for our work within the field. The APHSW-C certification was the result of years of work, spearheaded by Barbara Head and the leadership of Social Work in Hospice and Palliative Network (SWHPN). Comprehensive, evidence-based standards were developed and reviewed by experts in the field.2 The result is a pathway for pc and hospice social workers to validate their special skill set, which may, over time, lead not only to increased validity but more leadership and financial opportunities. Hopefully, this advanced practice certification will lead to increased financial opportunities such as pay increases for those with the certification, as well as creating the potential for inpatient palliative social workers to bill for their services, and increased opportunities outpatient billing. While this acknowledgment and use of the social work skill set is a great step forward, we still often struggle to “prove our value” to many medical teams, some of them even our own. We cannot bill for our inpatient services, unlike other team members, and this has often led to needing to assert our skills and impact perhaps louder than others (I have a particularly “loud” reputation!). Many PC teams still don’t have a PC SW, or are understaffed by national standards.3 It’s a difficult problem, funding a position that cannot generate direct revenue. However, more and more data point the important role of psychosocial care, as evidenced by the 2018 guidelines. We know intuitively, the expertise of the social worker impacts the quality of care for our patients. Sometimes it’s harder to prove this to the folks who are responsible for the bottom line. Another, more general, opportunity for growth for social workers in the coming year is a shift in where we see some palliative care programs “owned” within health care systems. As Palliative Care moves into the realm of population health including outpatient and home services, there will likely be more social workers in program and administration leadership positions, helping their teams and programs with these initiatives. This focus is perfect for the social work perspective of “person in environment”, first named by Mary Richmond, social worker in 1917. We see transition points in the framework of systems theory, which naturally assesses the patients’ needs in the context of where they are, meeting those needs and anticipating interventions going forward. As palliative care programs move into this home space, we encourage their use of the long-standing and well developed social work theories about how people adapt, change and cope. These skills will serve to enhance our palliative care efforts for the patients, families and our colleague providers. Another accomplishment for palliative social work at the beginning of the year was the publication of an incredible resource for the health social worker released in 2019: Palliative Care: A Guide for Health Social Workers. Edited by B. Sumser, M. Leimena and T. Altilio, Oxford Press. The outstanding collection of authors lend their expertise to complicated theoretical frameworks, clinical interventions, case examples and a variety of overarching issues related to providing the best care to patients and families. Undoubtedly, this new book will become the teaching resource for social work academic and field work to guide health social workers when working with seriously ill and/or dying populations. 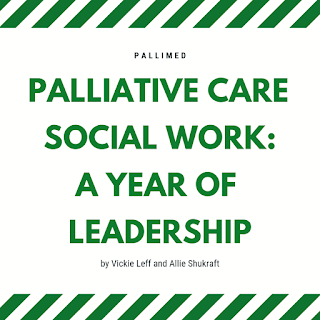 Finally, this year has seen an incredible increase in social workers in palliative care and hospice providing a variety of strategies and interventions to cope with compassion fatigue and burnout. One of the best articles came from Emily Browning on debriefings in the ICU.4 The debrief model has been used in social work for quite some time and translates extremely well to helping our colleagues with moral distress, increasing social support, decreasing isolation – all factors that impact one’s desire to leave the field. For more Pallimed posts on Social Work, click here. For more posts by Vickie Leff, click here. For more posts by Allie Shukraft, click here. Allie Shukraft, MAT, MSW, LCSWA is a reformed high school English teacher turned pediatric palliative care social worker with Carolinas Healthcare System in Charlotte, NC. She enjoys spending time with her family, trying out new recipes, and exploring the country whenever she can. You can find her on Twitter @Alifrumcally. 1. Ferrell B, et.al. National Consensus Project Clinical Practice Guidelines for Quality Palliative Care Guidelines, 4th Edition. Journal of Palliative Medicine. 2018;2018. 2. Glajchen M, et.al. Defining Core Competencies for Generalist-Level Palliative Social Work. Journal of Pain and Symptom Management. 2018;2018. 3. Spetz J, Dudley, N., Trupin, L., Rogers, M., Merier, D., Dumanovsky, T. Few Hospital Palliative Care Programs Meet National Staffing recommendations. Health Affairs. 2016;35(9). 4. Browning E. Reflective Debriefing: A Social Work Intervention addressing Moral Distress among ICU Nurses. Journal of Social Eork in End of Life & Palliative Care. 2018;14(1). The sun and fun of Orlando has come and gone for those of us lucky enough to steal away from our day jobs and attend the Annual Assembly of Hospice and Palliative Care. Hopefully everyone learned a lot, got re-energized and found their way back home safely. Thanks to the work of Lori Ruder, (@loriruder), Kristi Newport (@kbnewport), Allie Shukraft (@alifrumcalli) Pallimed was present in force a the meeting through Twitter (@pallimed). Beyond recapping some sesisons and re-tweeting the best tweets from the meeting we also used a few engagement techniques like #hpmRookie19, #hpmBingo and the #hpmTOTD (Tweet of the Day). This started spontaneously in 2017 as a way to highlight interesting, smart, funny, and meta-tweets from the meeting. We had some many good posts to choose from and you can check them out yourself. This year the voting is open until March 25th for the Tweet of the Conference, so if you have a Twitter account go vote now! So now it is time to vote for the Tweet of the Conference among each of the previous day winners. Anyone can vote, you did not need to attend the conference. Voting is open for 1 week! If I missed you and you were new to Twitter this year or this was your first conference let me know and I will update the list! Overall the numbers this year for Twitter engagement were down from the nearly 2,000 particpants and over 30 million impressions from past Annual Assemblies. I'm not quite sure why that is, and i would love to hear form some of you on why you think this is happening. I have some theories, but want to hear from others and look closely at the data. The Annual Assembly of AAHPM and HPNA is this week and if you are going to Orlando, or staying home to keep things running smoothly, social media can help make your conference experience be transformative. Since 2009, the Assembly has been making use of Twitter to provide additional insight, commentary and sources for the multiple sessions each day. Now things are expanding to dedicated conference apps, Facebook and Instagram. And for the third year in a row, the Tweet of the Day (#hpmTOTD) will bring you the highlights of the conference and #hpmBingo will help make sure you do as much as you can while at the Assembly.If you don't know how to use Twitter to your full potential, just keep an eye out for Tweet Pros and don't be shy. If you just want some general tips for attending the Annual Assembly read up on our handy hints for attending a national conference. 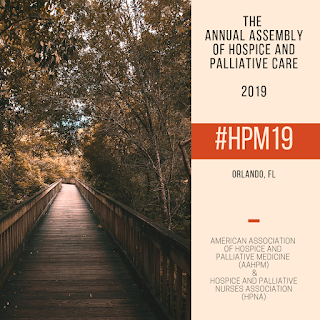 The official hashtag of the conference: #hpm19 (works on Twitter, Facebook, Instagram), use it in every tweet this week! Here is a post on how Twitter can be helpful at a healthcare conference. Other key hashtags for the conference will be added here to this Google Document. The Pallimed Network will feature content across multiple platforms. Don't forget to read up on #hpmParty which happens every Thrusday night at 9pm of the Annual Assembly each year. 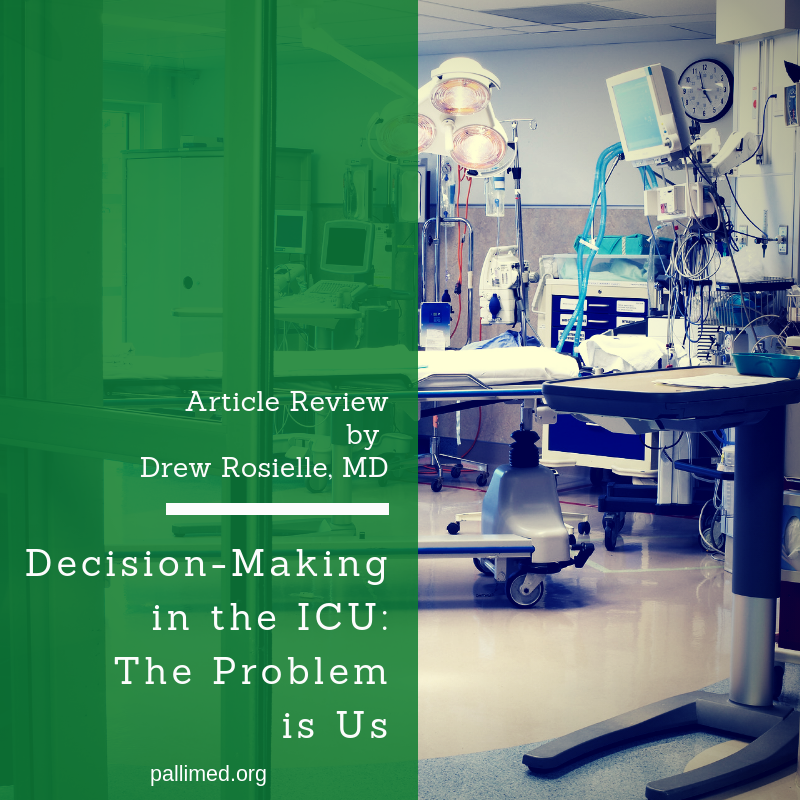 Annals of Internal Medicine has published a fascinating trial of a web-based surrogate decision-making tool aimed at improving decisions for patients receiving prolonged mechanical ventilation in an ICU. It's one of the most fascinating trials I've read in a long time, and also somewhat of a monster (in size/scope of data presented) - there are 4, lengthy online supplements attached to it (! ), which is daunting, and so I'm mostly just going to write here about what I find most interesting about it. Which is that I think this may be the trial which should convince us all that what's 'wrong' with ICU decision-making is not a lack of sharing good information -- what is wrong is our entire approach to surrogate decision making. First the trial, briefly summarized. 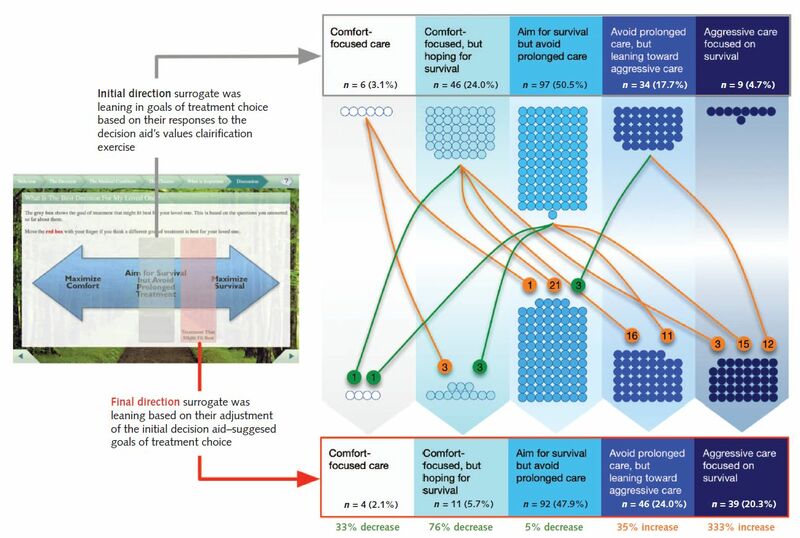 This was a randomized trial of a personalized, web-based decision aid for surrogate decision makers of patients with prolonged mechanical ventilation. It took place in several ( mostly academic medical center) ICUs in the US. The subjects were primary or secondary surrogates of actual ICU patients (~280 patients in total), all of whom had been mechanically ventilated for 10 days at least, and weren’t anticipated to be immediately extubatable. 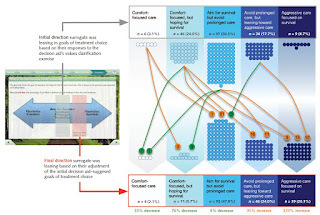 The tool involves giving the surrogates prognostic information about their loved one (based on a prognostic model) which gave an estimation of their loved one’s chance of 1 year survival; educational information about prolonged ventilation, the role of surrogates, and different care goals (eg life prolongation at any cost, maximizing comfort regardless of longevity, etc), and asked the surrogates questions about the patient’s values/preferences. Then the aid presented to the surrogate a ‘goals of care recommendation’, based on those reported values/preferences. The surrogates had an opportunity to disagree with what was presented, and indicate what they thought the actual care goals should be. The ‘output’ of the decision-aid was given to the treating clinicians, who were encouraged to incorporate it in the family meeting which was scheduled for day 2 after enrollment for all patients. Control patient surrogates received no decision aid or other information, and just received 'usual care', apart from that everyone was supposed to have a family conference on day 2 post enrollment (and nearly everyone did). They measured many, many things here, but the major outcomes they were looking at were clinician-surrogate concordance about prognosis, surrogate understanding of prognosis, surrogate well-being both acute and long-term (anxiety, trauma symptoms, etc), patient outcomes like LOS, in-hospital and long-term mortality, etc. The simple way to summarize their findings is that the intervention had nearly no measurable effect on anything: most importantly on what happened to the patients (eg, ICU and hospital LOS, ICU and hospital mortality, long-term mortality, % who received tracheostomies, % who had discontinuation of life-prolonging technologies, etc), as well as what happened to the surrogates (anxiety and trauma symptoms, satisfaction with care and communication, etc). One of the numerous pre-specified secondary outcomes (changes in a decisional-conflict scale), was slightly better in the intervention group - by 0.4 points on a 5 point scale. Note that the family meetings which were part of the protocol for everyone were recorded and similar content was discussed at these meetings, regardless of randomized group. The very, very interesting findings were, at least to me, the ‘concordance’ and prognosis findings (if you want to look at this yourself, the best place to go is Online Supplement 3, by the way). Concordance (meaning surrogate and clinician ‘agreement’ on prognosis which here was measured as chance of 1 year survival) was not improved by the intervention. Fundamentally, that seems to be because surrogate’s assessment of prognosis was essentially impervious to information about prognosis as either presented by the prognostic model in the decision aid or a clinician in the family meeting. Notably, the physician’s prognostic estimations were quite accurate on average (I don’t know if they had access to the prognostic model prognosis or not). For the entire study the the physicians and model both predicted a ~50% 1 year survival for the patient group on average. The physicians also did a pretty good job of estimating what the surrogates thought the prognosis to be (which was around 70% 1 year survival on average). The surrogates who had the decision aid did a little better at articulating what they thought the physicians’ prognostic estimation was (they guessed around 58% 1 year survival, when it was actually around 49%). Control surrogates, who did not get the decision aid, did a worse job of articulating the physicians’ estimation (they guessed ~67%). However, regardless of what group they were in, the surrogates in both groups articulated a prognosis of around 70% 1 year survival. Ie, the intervention didn’t improve the surrogates’ own prognostic estimation, even though they knew it was significantly different than the physicians’ estimate of survival. Along these lines, they were also able to show that even after answering questions about what the patient’s values would be, and then being told by the decision aid some sort of conclusion (eg your loved ones care goals fit best with eg, balancing longevity with quality), a large number of surrogates actively adjusted that conclusion (‘disagreed’ with that conclusion so to speak, although the surrogates themselves were the one who gave the answers to the questions about patient values), and almost all of them who did that adjusted the care goals towards being more aggressive (see the figure - this was about 40% of the group). To summarize: surrogates substantially overestimated patient’s survival, even when presented with the decision aid, and even when they understood that the physician thought otherwise. Many surrogates also disagreed with the goals of care as summarized by their own statements of their understanding of patients’ own values, and wiped that all away to state that the plan of care should be aggressively prolonging life. There is this idea that what we need to do is somehow say the right words to these terrified, grieving, desperate families, and once we figure out the right words, spoken by the right person/presented in the right way (like a decision aid which focuses on clearly stating prognosis and prompting surrogates to reflect on the patient's values/preferences) that will lead the surrogate/s to make the 'right' decision. 'Right' decision meaning, I guess, the one purportedly the patient would have made ('substituted judgment'), acknowledging that that is typically unknowable. The problem with this model of surrogate decision making is that it does not at all seem to be what surrogates actually do, and data from this study basically show even when surrogates know things about a patient's values and preferences, many of them are unwilling to 'enact' those. Indeed, a substantial number of the surrogates in this study seem impervious to 1) objective data-based prognostic information, 2) accurate prognostic information shared by the patient's treating physician, and 3) acknowledgement of the patient's own values and preferences when they make decisions. And, in fact, it appears that a substantial number of surrogates don't really make any decision at all, and you wonder if they even perceive there to be any decision to be made, because the only 'decision' they are going to endorse is 'do everything.’ I’m really grateful for this study for really showing us that this approach may not be helpful. And my question to us, collectively, as a medical community, is: so what? Do we think this is a problem? And if so, why? Why is anyone surprised or perturbed that fearful grieving families don't make the same decision that an ethical robot would? The only reason we think it's a problem is because there's been this collective decision the last several decades that, in fact, the right people to be making decisions about what technologies to be applying to a dying body are not the highly trained health care professionals, most of whom went to school/trained for over a decade (and sometimes much longer) just so they can know their way around an ICU, but the shocked, grieving, fearful families, who hear us demand from them, again and again, and in ways that make them feel that they have their loved one’s life in their hands, What do you want us to do? I ask this because if you listen closely to your colleagues, and even palliative people sometimes, you get a sense from some of them is that they believe the problem here is the grieving families, who are ‘in denial’, or ‘unrealistic’, or ‘just don’t trust us’. And, fundamentally, I think that’s the wrong take here. We’re the problem, not the families. It also bears noting that in the entire history of our species up until the mid 20th Century, virtually no one had to make end of life decisions for their loved ones, because there wasn't anything that could even be done. Now, it's not at all uncommon for us to have conversations with people about highly technical decisions about where tubes go (or don't go) into their dying relatives' bodies. No one should be surprised it often doesn't go well, and that it's a 'problem' that can't be fixed with communicating data more artfully. I get it; this is complicated. There are, for instance, a certain number of patient/families for whom this very nice idea I described above, the happy version of how surrogate decision making is supposed to work, does seem to ‘work.’ Honestly, I’m not too worried about those families - we just need to get them good, realistic information, and they’ll make patient-centered decisions. I also get how unrealistic (and unwise) it is to think we are going to go back to the authoritarian-paternalism days, where an individual physician's personal judgment, subject to all its biases and blind spots, is the unassailable measure of a good decision. The only way out of this is forward, although I don't myself here have any specific 'policy' proposal to fix this, and I worry all the focus on patient choice (which originally was meant to be a way to empower patients in saying "No" to things, not a way of us in medicine of giving up our role in decision making) just makes things worse, by amplifying this idea that families get to choose medical treatments off a menu at the end-of-life, when there is nowhere else in medicine where we really do that. All the things we are taught to do in palliative care - focus the conversation on the patient, emphasize long-term health and functional outcomes and discuss care goals in that context as opposed to focusing on technical questions, careful, interprofessional attention to the grief and loss the family are experiencing, and actively making recommendations about what we think the best plan is (based on what we know of the patient) - help, undoubtedly, to an extent. But it’s not enough. For more Pallimed posts about journal article reviews. For more Pallimed posts by Drew click here. Drew Rosielle, MD is a palliative care physician at the University of Minnesota Health in Minnesota. He founded Pallimed in 2005. You can occasionally find him on Twitter at @drosielle. 1 Cox CE, White DB, Hough CL et al. "Effects of a Personalized Web-Based Decision Aid for Surrogate Decision Makers of Patients With Prolonged Mechanical Ventilation: A Randomized Clinical Trial" Ann Int Med. 2019. Vol 170, 285-297. 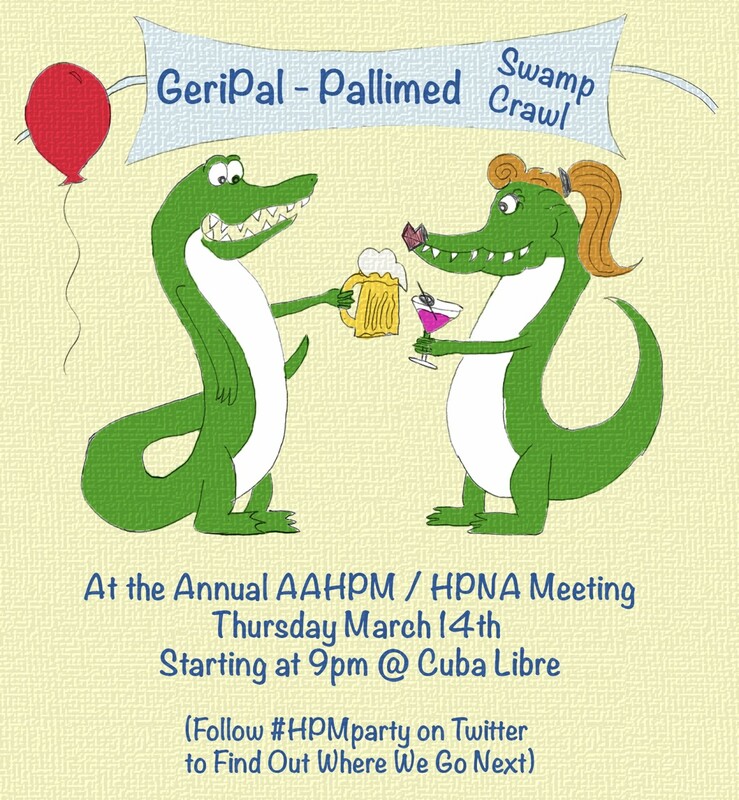 The Annual Assembly of Hospice and Palliative Care is only a week away, and it is time to announce the details for the 13th Annual Pallimed-GeriPal Party! Just so you all know from here to eternity, the answer to the question of "When is the Pallimed-GeriPal party?" is Thursday night at 9pm local time the week of the Annual Assembly of Hospice and Palliative Care (but just to be clear it is not an official part of the meeting). We love meeting other hospice and palliative care clinicians and advocates, so feel free to invite and bring any colleagues or new friends with you as this is not an exclusive crowd. This year we will have the traditional pub crawl and returning for the second year the #hpmParty ESCAPE ROOMS! For the pub crawl we will be starting at Cuba Libre at 9pm in the Saratoga room Thursday, March 14th. Around 10pm, we will likely be moving on to the next destination. Like always though, these are rough estimates of time, so if you want to know the details, follow the hashtag #HPMparty on Twitter. We are also partnering with The Escape Game in Orlando, about 1.5 miles north of the conference. We have three rooms booked this year with room for 8 people in each room, and as a new twist this year, each room will have a secret palliative care celebrity guest, so that means there are only 21 slots available! The starting times for the rooms are 830pm, 840pm and 850pm and each room takes no more than one hour, so you will have time to join the pub crawl in progress (or not at all, if that is not your thing!). If you want to do the escape rooms, book your tickets ASAP. No need to buy anything or sign up for anything if you are just doing the pub crawl. You will want to get to the Escape room 15 minutes ahead of your scheduled time and it takes 10 minutes by car and 30 minutes by foot. Be on time! - Follow GeriPal on Facebook, Twitter and your favorite podcasting app. I made some interesting observations during my first ever trip to the AAHPM National Assembly in Boston, almost a year ago. It seemed to me that I was not the only one favoring my phone screen over introducing myself to hundreds of new people. My new Twitter follower to friends IRL ratio (‘In Real Life,’ for those wondering) was about 25:1. I noticed people often trying to find seats in a lecture hall at least a few spaces away from others, to a point where some rooms looked like those old science problems involving the diffusion of a gas. I wondered to myself how many people here are introverts like me? Some months after that conference, I decided to poll the #HPM Twitter family to see if I could get a sense of how many identify as introverts. While 72 responses may not seem like an overwhelming sample size, I couldn’t help but feel at least partially validated with three-quarters identifying as introverts. 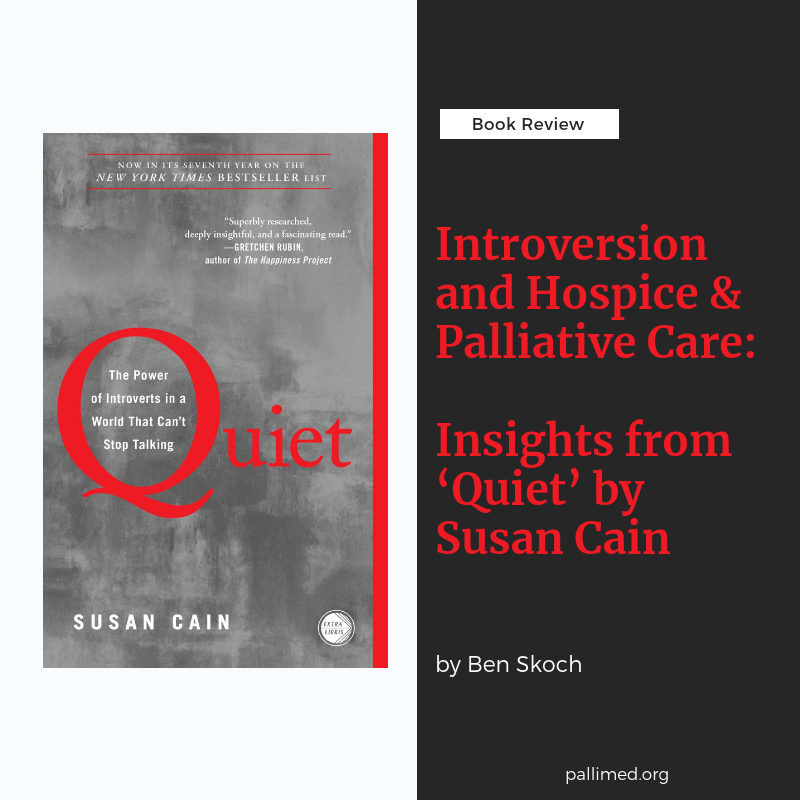 Does the field of Hospice and Palliative Medicine naturally attract introverted people? For #hpm people, would you identify more as an introvert or an extrovert? RT and @ some #hpm friends so we can get more responses! It wasn’t until I read “Quiet: The Power of Introverts in a World That Can’t Stop Talking” by Susan Cain, that I discovered some potential explanations. At one point in the text she describes her interviews with Harvard Business School students who learn best in “learning teams” and describe socializing as “an extreme sport (47),” situations that would make any reserved person naturally uncomfortable. I recognized some of her sentiments seemed to overlap significantly with my years of medical training, and I couldn’t help but think that she was describing so much of my life. I sure did not use my first trip to AAHPM’s Annual Assembly (in Boston no less, just minutes from the entertainment enthusiasts that Cain describes) as a chance to socialize as much as physically possible. Introverts might be wired to handle the emotional ups and downs of Palliative Medicine more naturally. How often have those in Hospice and Palliative Medicine heard, “That must be so hard,” or “Isn’t that so sad all of the time?” Cain describes an interview with Janice Dorn, MD PhD (Psychiatry and Neuroscience) who counsels people involved in the trade market. Dorn says “introverts…are more successful at regulating their feelings…they protect themselves better from the downside (158).” She suggests that this may be in large part due to the way we are wired, as extroverts are more excitable and are more likely to “find themselves in an emotional state we might call ‘buzz.’” So perhaps introverts are better biologically equipped to handle sad and tough conversations. It’s an introvert’s natural tendency to let others talk. I am confident that one of the most important things I do for my patients is to listen as they tell their stories. By providing “therapeutic silence” and “active listening,” I offer them a chance to explore their emotions. This is how I build trust so that we can work together to make personalized decisions. In her book, Cain presents the findings of psychologists John Brebner and Chris Cooper, “who have shown that extroverts think less and act faster…introverts are ‘geared to inspect’ and extroverts are ‘geared to respond (166).” Many physicians find it difficult to simply sit and listen, as evidenced by a study from 2018 that showed a median time of 11 seconds before physicians interrupted their patients.1 Perhaps this is a system flaw. As students, we are continually encouraged to be more extroverted; then during residency, we are trained to ask specific questions and document succinctly to be as efficient as possible. By the time one becomes an attending physician, we unconsciously adhere to this learned sequence. Or perhaps some of us are just wired to listen longer and let others talk, and we simply need to find a niche where this is useful. 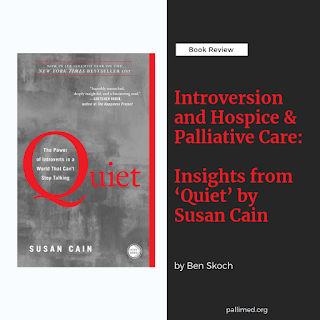 Maybe the most compelling connection between Quiet and Hospice and Palliative Medicine is when Cain describes how introverts might get the most out of life. “The secret to life is to put yourself in the right lighting…Use your natural powers – of persistence, concentration, insight, and sensitivity – to do work you love and work that matters (264).” When people who work in Hospice and Palliative Medicine are asked to describe their work, common answers are rewarding, satisfying, gratifying, etc. I think this is likely because many in Palliative Care are introverted and they have simply found the “right lighting” for their natural abilities: an unflappable personality in the face of a wide range of emotions, listening intently to their patients, and using persistence, concentration, insight, and sensitivity to help patients and families struggling with some of life’s greatest challenges. We all have special gifts that make us unique, and it is up to us to figure out how to use those gifts to help others and make the world a better place. As Cain details well in Quiet, it may be that extroverts have an advantage in utilizing their gifts in our modern society. Maybe our culture inhibits some introverts from recognizing their strengths and talents until later in life when they discover pastimes, relationships, and work that enhance these traits. Perhaps the world needs introverts to flourish like those examples Cain highlights: Dr Seuss, Rosa Parks, JK Rowling, and many others. Once introverts find their “right lighting,” they can build a life that is fulfilling and do work that matters. Maybe they will even wind up in a field like Hospice and Palliative Medicine where there is a connection between the strengths of introverts and the nature of this sacred work. I think if you are an introvert looking for work that is abundantly rewarding and can be a natural fit for your God-given abilities, perhaps Hospice and Palliative Medicine is worth your consideration. It might be the dream job that gets you excited to start each day, even if you have a hard time showing it. Ben Skoch, DO, MBA, is a Hospice and Palliative Medicine physician at the University of Kansas Medical Center. Outside of Family and Palliative Medicine, he enjoys most sports, black coffee, and most especially spending time with his wife and two adorable children. 2. Ospina, NS et al. Eliciting the Patient’s Agenda- Secondary Analysis of Recorded Clinical Encounters. Journal of General Internal Medicine. January 2019; 34: 1: 36–40. Annals of Internal Medicine has just published one of the better trials of compounded analgesic creams I've yet to see, and unfortunately it's pretty damning. 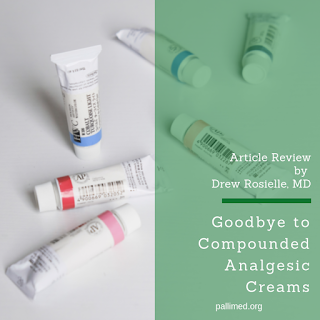 It's a randomized, double-blind, placebo-vehicle controlled, intention-to-treat, 3 parallel armed study of 3 different compounded creams for adult patients (median age ~50 years, ~50% women) with localized chronic pain (the 3 groups had neuropathic, nociceptive, or mixed pain syndromes). It took place at Walter Reed. Each arm had about 130 subjects (which, for this type of research, and compared to many other investigations of compounded creams, is quite a lot). Patients needed to have chronic pain (longer than 6 weeks), rated at least 4/10, and localized to a body area or two extremities. Broadly speaking about half the subjects' pain was incited by an injury or surgery. 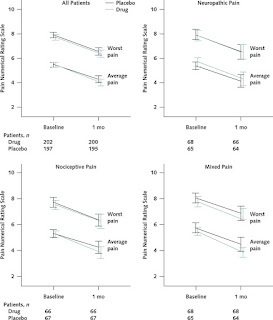 Pain was classified as nociceptive vs neuropathic vs mixed based on a pain physician's assessment, more or less. About 20% of patients were on systemic opioids. 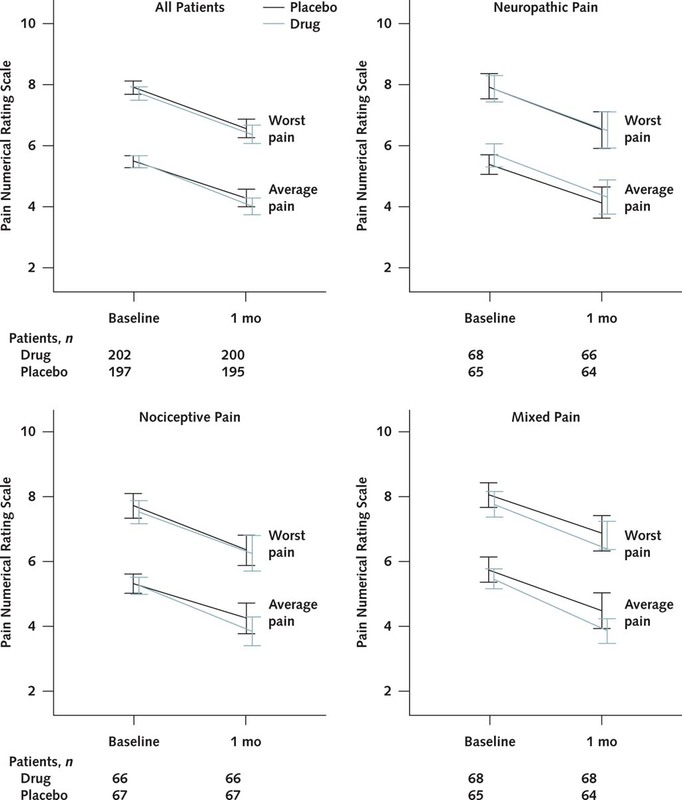 The primary outcome was average pain score after 1 month of treatment. They presented several prespecified secondary outcomes too. The study had 90% power to detect a pain reduction of 1.2 (out of 10) points with 60 patients per treatment arm, which they met. Basically there weren't any statistically, let alone clinically, meaningful differences between the groups, regardless of pain type. For all groups, pain was reduced at a month by around 1-1.4/10 points on the 0-10 NRS, regardless of receiving active drug or placebo cream. Secondary outcomes including patient judgement of a positive outcome (ie, the percent of patients who reported they considered the cream a success) were the same between all the groups too (around 20%). Health related quality of life did not differ either between groups at a month. This study is one of the largest and best-designed study I'm aware of of these creams, and the findings are pretty clear: such creams benefit patients via placebo mechanisms, aka they don't work. Note that there is a separate body of research on some other topicals which should not be confused with this study. Eg, the 5% lidocaine patch for post-herpetic neuralgia, topical capsaicin for a variety of neuropathies, and at least some topical NSAIDs for osteoarthritis, and topical opioids. I'm not broadly endorsing those either - it's complicated - however they weren't tested here and the take home point is we should stop making our patients pay exorbitant out of pocket costs for these compounded analgesic placebos, not necessarily those others. Particularly for painful axonal neuropathies, many of us struggle with how to control those adequately, especially chemotherapy induced ones which don't respond well to most systemic drugs, and I've ordered plenty of fancy creams in the past for my patients, most of whom paid out of pocket for them, and I think it's time to stop doing that. For more Pallimed posts about journal reviews.